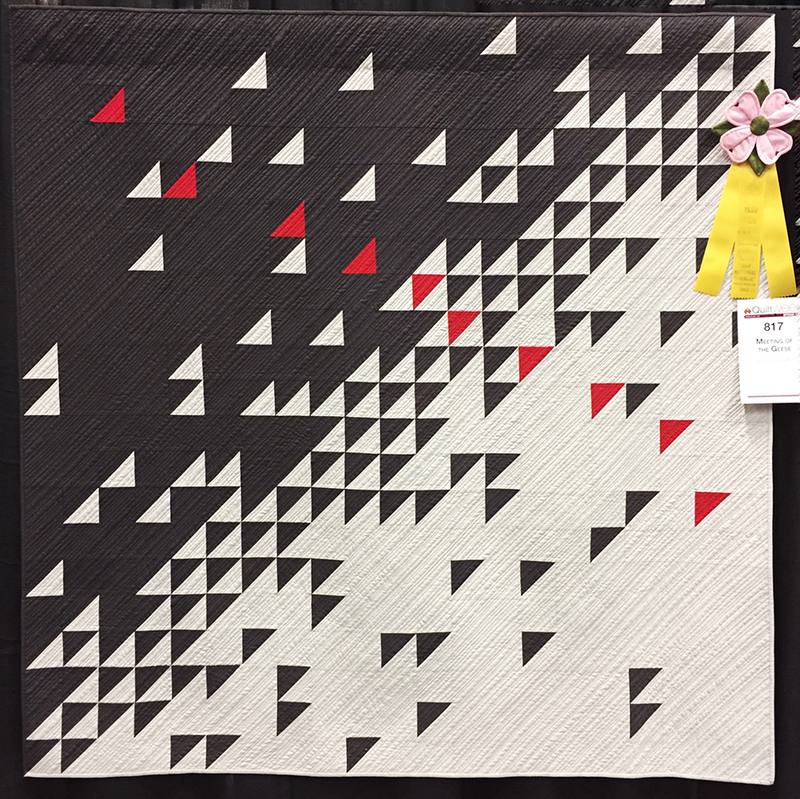 Negative space is one of my favorite tools to use in my modern quilt designs, and I was ecstatic when Sylvia Schaefer released her book, The Quilter’s Negative Space Handbook. In this book, Sylvia takes the concept of Negative Space and breaks it down into eight manageable sections for the reader to explore. 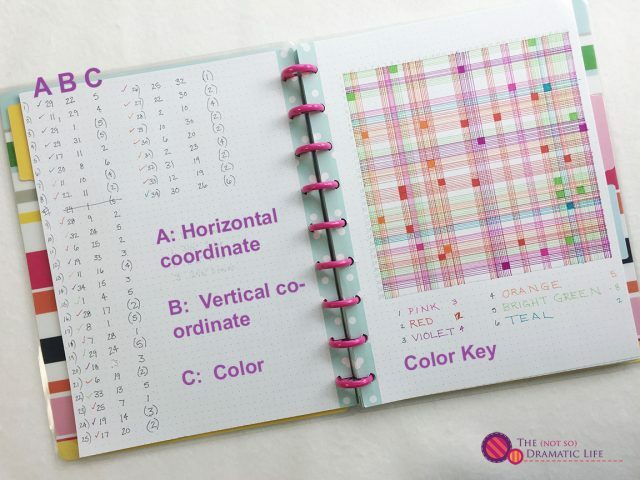 These sections can be used on their own or mixed and matched to develop your own unique designs. While there is a project to illustrate each type of negative space, the reader is actively encouraged to apply each approach to their own original designs. This combination makes the book perfect for all levels of quilters. 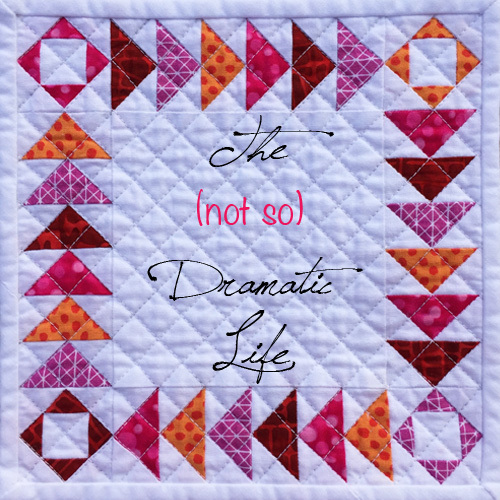 At the end of this post, you’ll have an opportunity to win a digital copy of The Quilter’s Negative Space Handbook, so I hope you’ll keep reading! 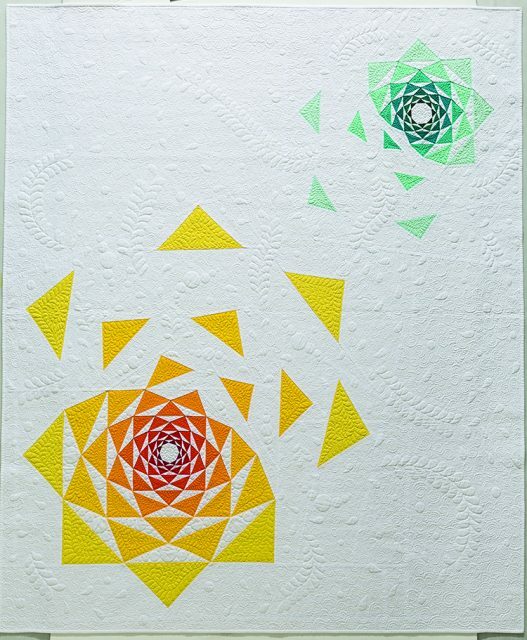 Sylvia has a great eye for negative space, and I have been a fan of her work ever since I saw her quilt, The Disintegration of the Persistence of Artichokes at an American Quilter’s Society show in Paducah one year. 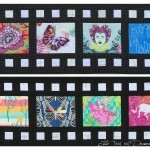 A couple of years later we had our quilts (both using lots of negative space!) hanging side by side in the winner’s section of the Modern category at another AQS Paducah show. This time it was Meeting of the Geese that I was admiring. 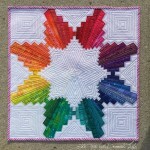 Most recently, I was honored to quilt Northern Lights for the book. 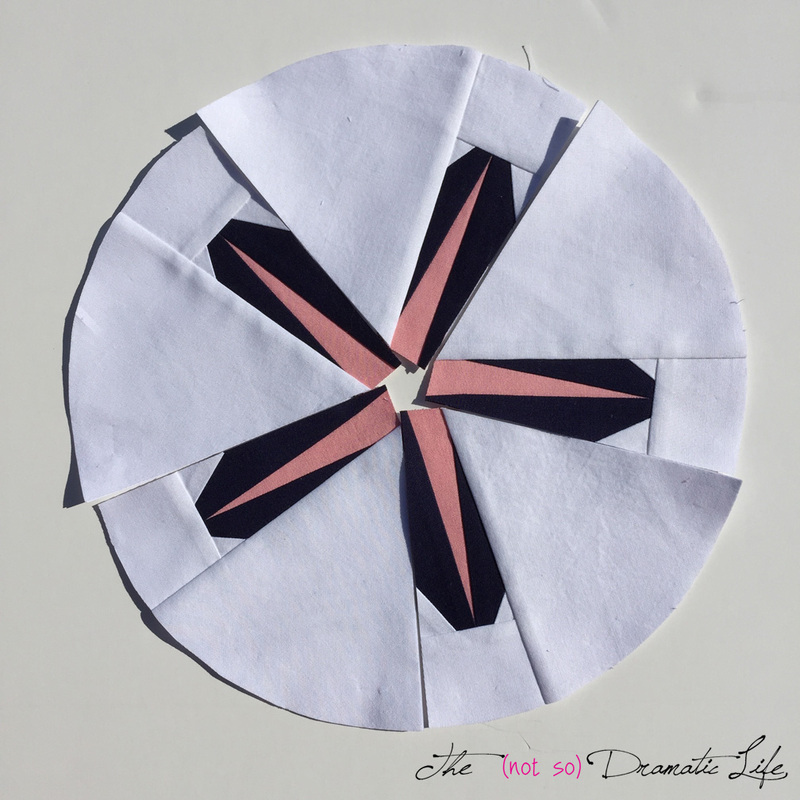 The edge to edge motif is a digital download by Anita Shackelford. I am looking forward to further exploring each of these approaches to negative space, but the one I couldn’t wait to try was scattering. 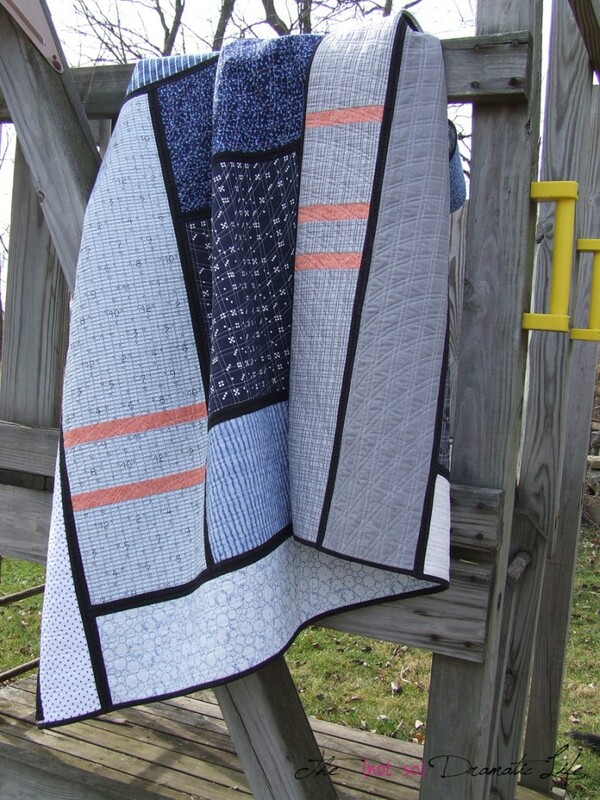 I have made several plaid quilts, and I thought some of Sylvia’s suggestions would be fun to try in creating a new design. 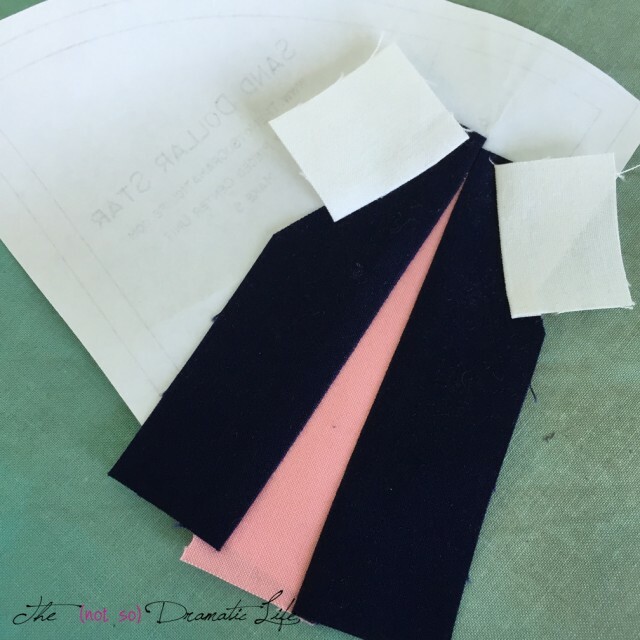 (Please check out this post about Infused Plaid to see how my typical design process differs from what I am doing here!) 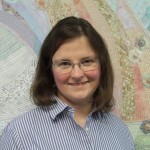 In the book, Sylvia mentions using a random number generator to determine block placement. This really caught my attention, and before I even went to the next page of the book, I googled “random number generator” and started sketching. For this design, I started by setting a few parameters. 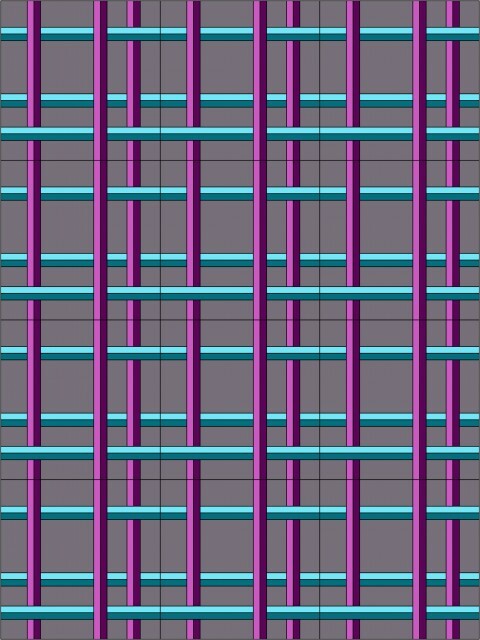 The grid is 34 units by 34 units, and I decided to place 34 colorful squares into that space. 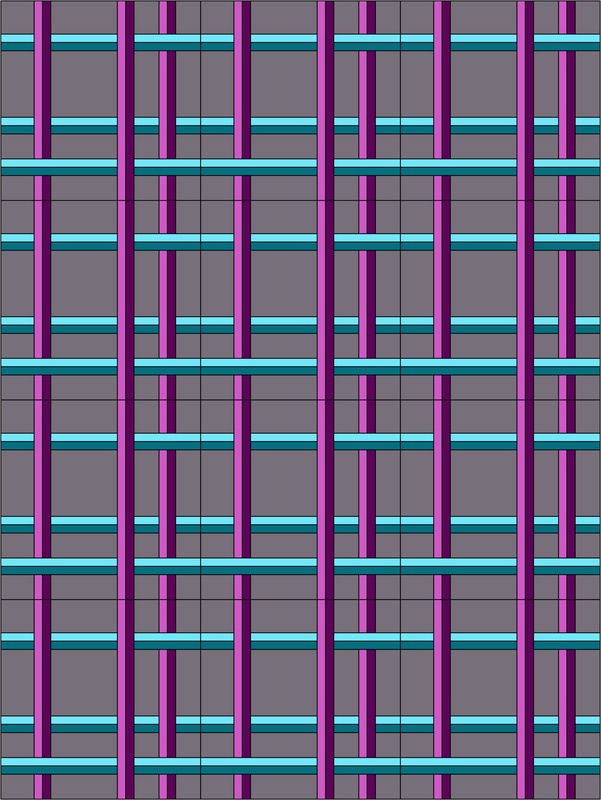 I used a random number generator for each of the horizontal and vertical coordinates, then rolled a game die to determine the color of the square. Since the linear matchstick quilting that creates the plaid effect will extend through the squares, each row and column was assigned a color for all future squares that were placed in them. Once the main pieced section was developed, I decided that extra negative space would really set off the design. Considering the concept of breathing space that is introduced in the “Standing Alone” chapter, I decided that the top and right sides of the main section would be about half the width as the borders on the bottom and left sides. 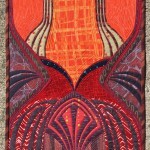 Here is the quilt top, complete with borders. I always make these plaid quilt tops a few inches larger than the desired finished size. 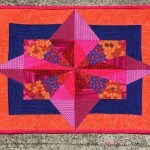 This allows me to block the quilt and trim it to the size that looks best. 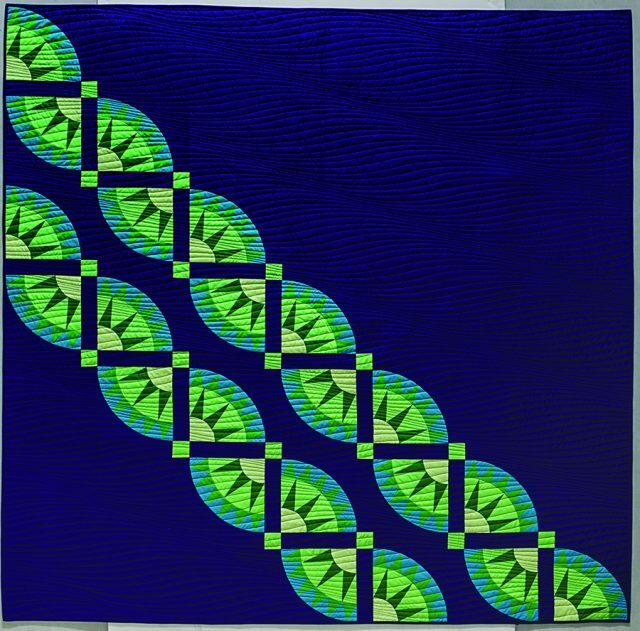 When I add the quilting to this piece, I will be incorporating a third type of negative space usage to the quilt, extending lines. 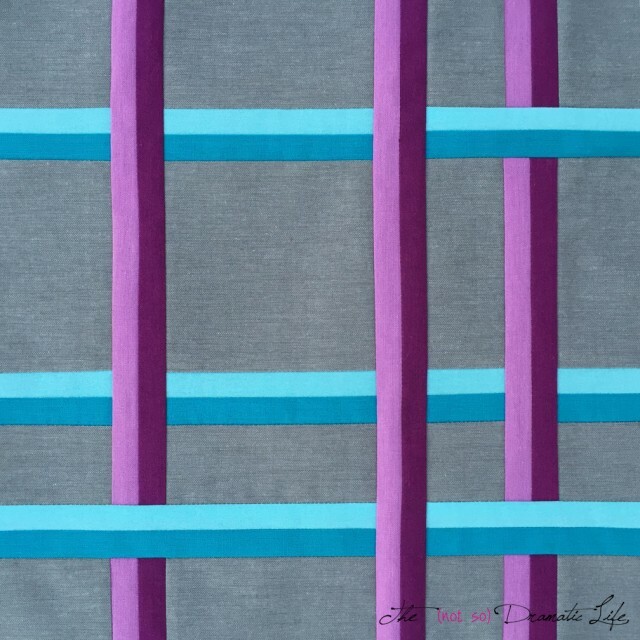 I love to allow colorful quilting thread to take on a staring role, and this should be a an interesting way to infuse color into the surrounding space. 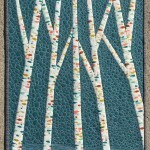 Hopefully, I will be sharing the final quilt with you soon! Here’s the exciting part! 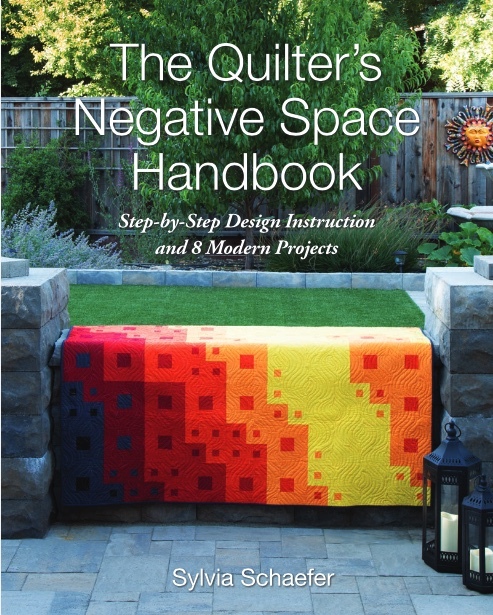 If you would like to win a digital copy of The Quilter’s Negative Space Handbook, just leave a comment on this post. 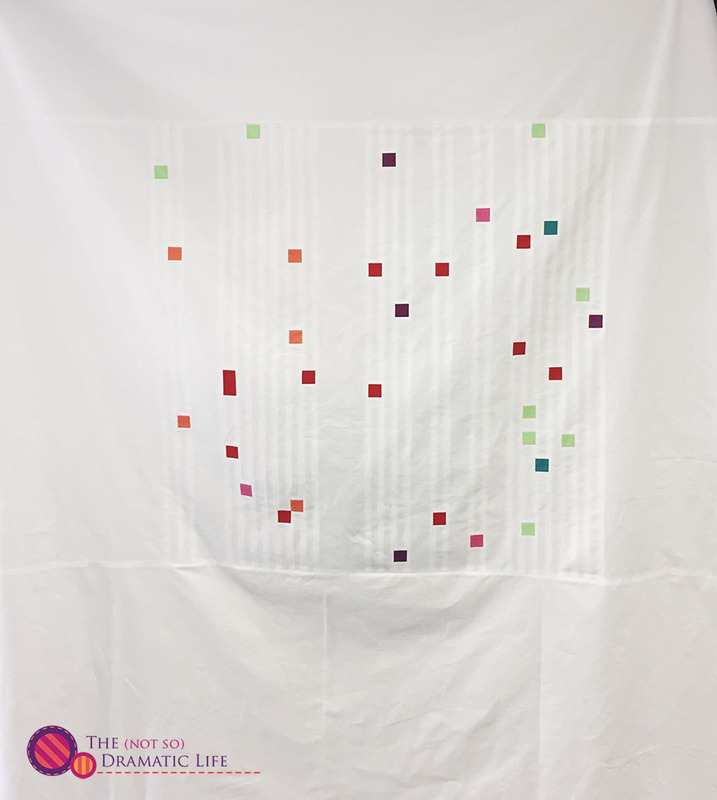 Any comment counts, but if you are looking for inspiration, tell us about your favorite quilt using negative space. 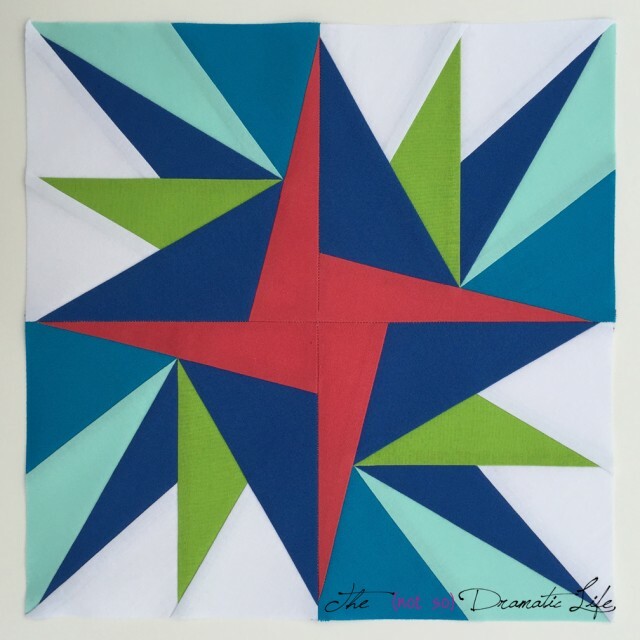 It can be a quilt you made, or a quilt created by someone else. One entry per person, please. One week from today, Monday, March 25, 2019, I will use a random number generator to select a winner of a digital copy of the book. You can also order a copy directly from the author! There is lots of inspiration at the other stops on the blog tour, so I hope you check out these other negative space inspired posts! 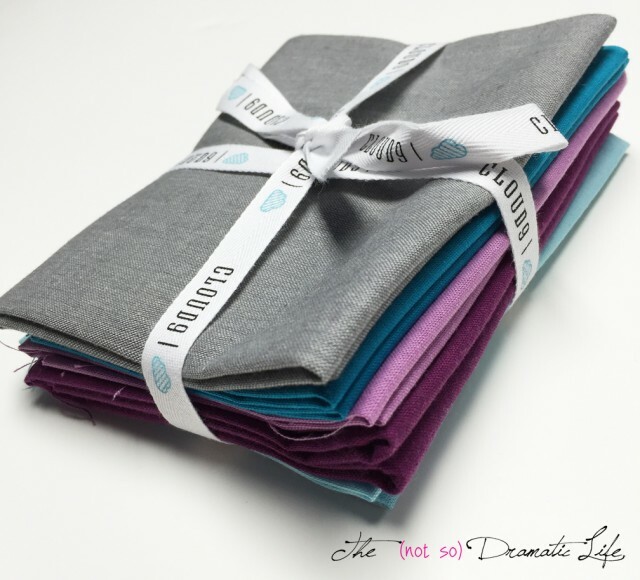 I love designing new blocks and quilt designs, and I am so excited to work with the wonderful palette of solids provided by Cloud 9 Fabrics! Designing this block took me back to my undergrad years as a painting major when I spent a great deal of time experimenting with pattern, particularly plaid. The group of Organic Cirrus Solids in a Berry Harvest Color Palette included a dark and light version of two of the colors, so I was inspired to use these to create an illusion of dimension. 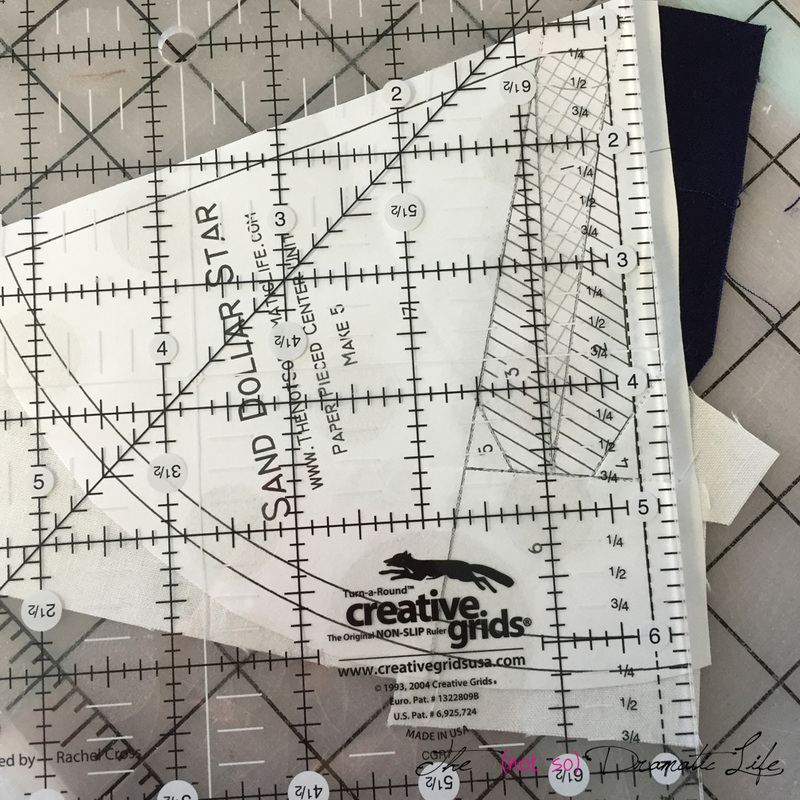 Standard machine piecing techniques are used to construct this block, so anyone who is comfortable with accurate cutting and stitching a consistent 1/4″ seam allowance can make this block. 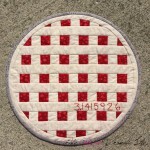 The pattern for Berry Patch Plaid is available as a free download on Craftsy. 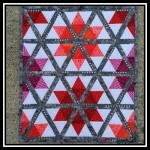 Multiple blocks would make an awesome complete quilt! More than 60 new blocks have been shared during this three day hop, so I hope you will take a look at some of the wonderful designs that have been created in this color scheme! A big thank you to Cloud 9 Fabrics and our wonderful hosts, Yvonne of Quilting Jet Girl, Cheryl of Meadow Mist Designs, and Stephanie of Late Night Quilter! 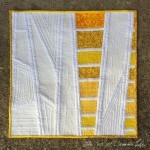 Today I am thrilled to share with you my creation for the Paintbrush Studio New Block Blog Hop. 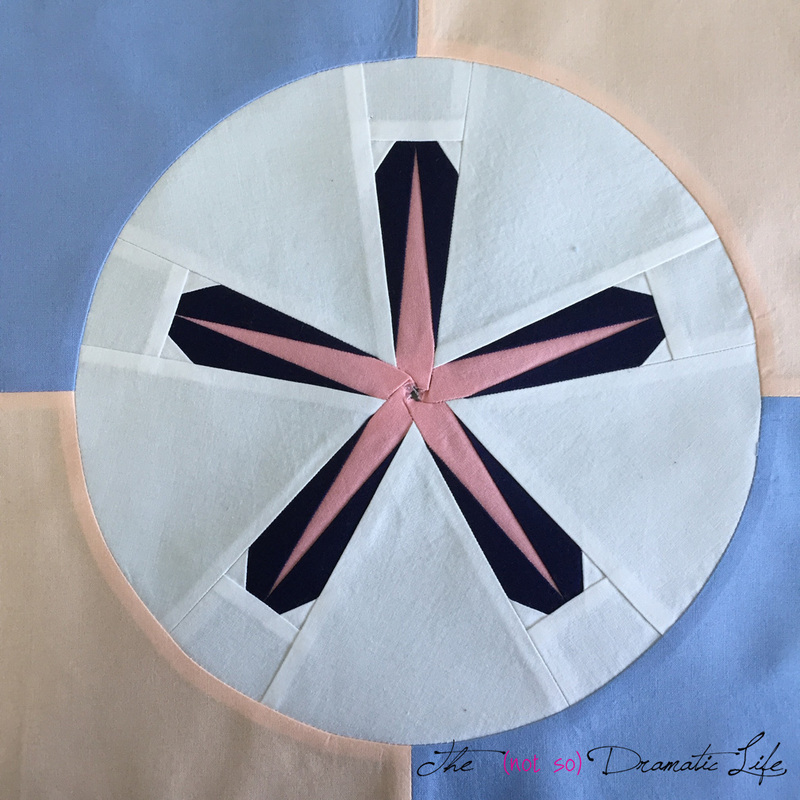 The Ocean Sunrise palette of fabric inspired me to create a block loosely based on the five pointed design found on sand dollars along the shoreline. 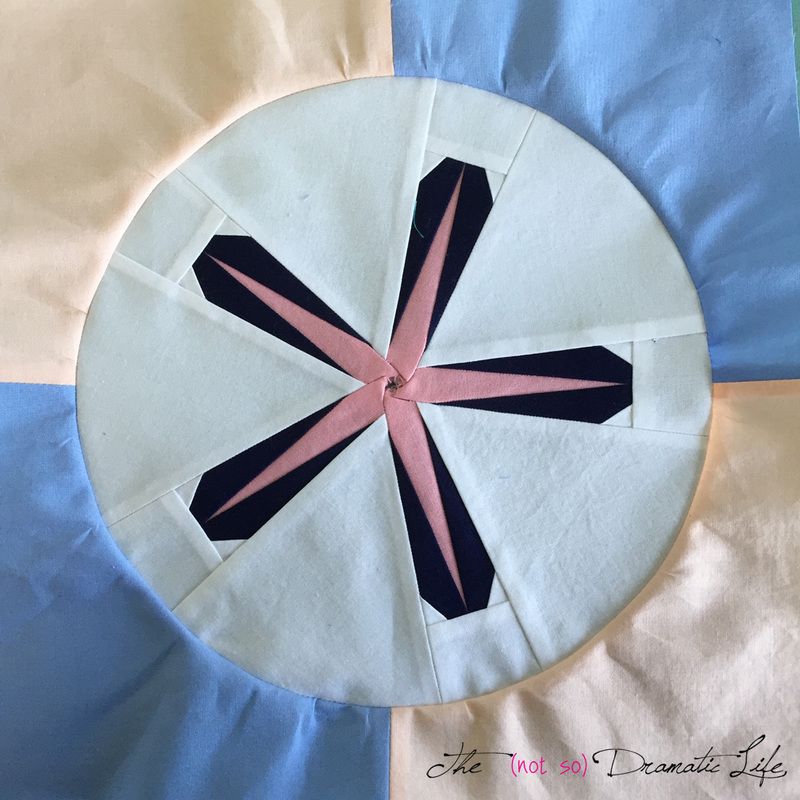 The Sand Dollar Star Quilt Block is an excellent skill builder block that is created using foundation paper piecing (FPP), curved piecing, and is finished with a fabric yo-yo. Foundation paper piecing gives you lovely, precise points, resulting in a block with a clean, professional appearance. 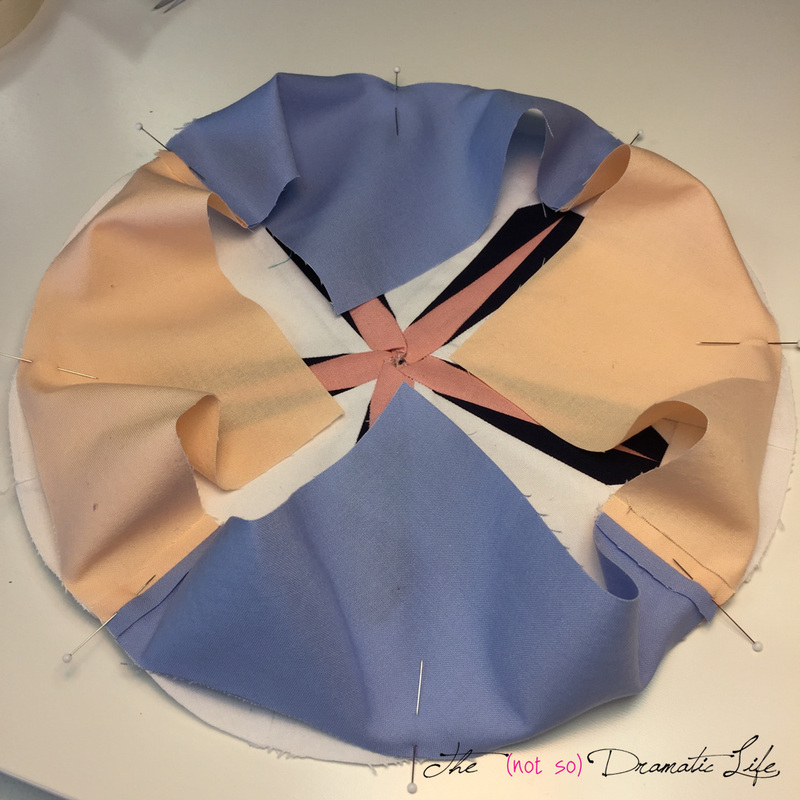 Once this step is completed, you will set the inner circle you created into the outer section of the block using a traditional curved piecing process. To complete the block, you will create a fabric yo-yo that is hand appliquéd onto the center of the block. 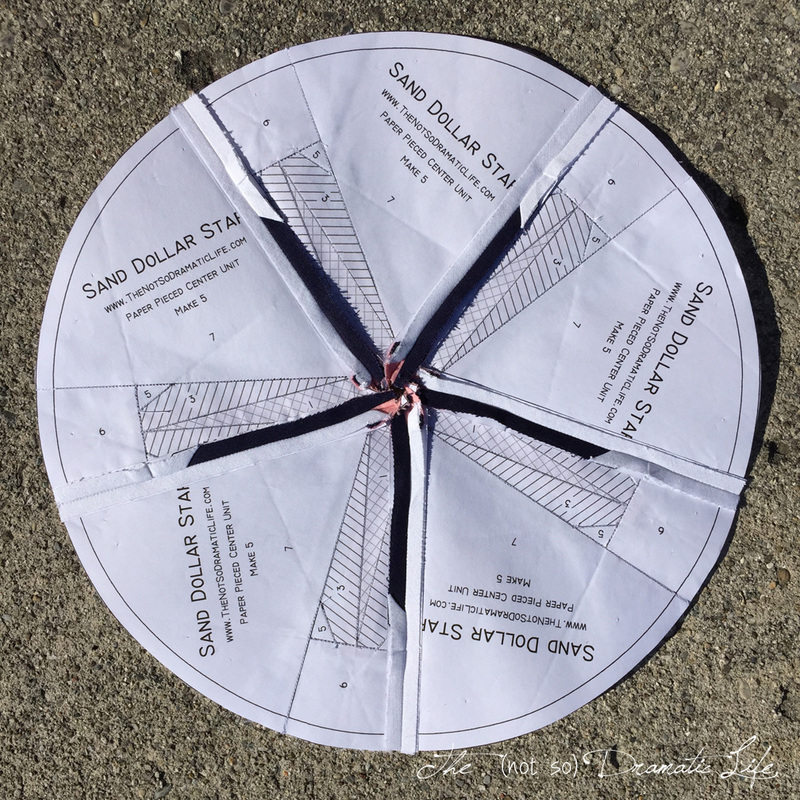 The complete directions and full scale templates for Sand Dollar Star are available for download at Craftsy. 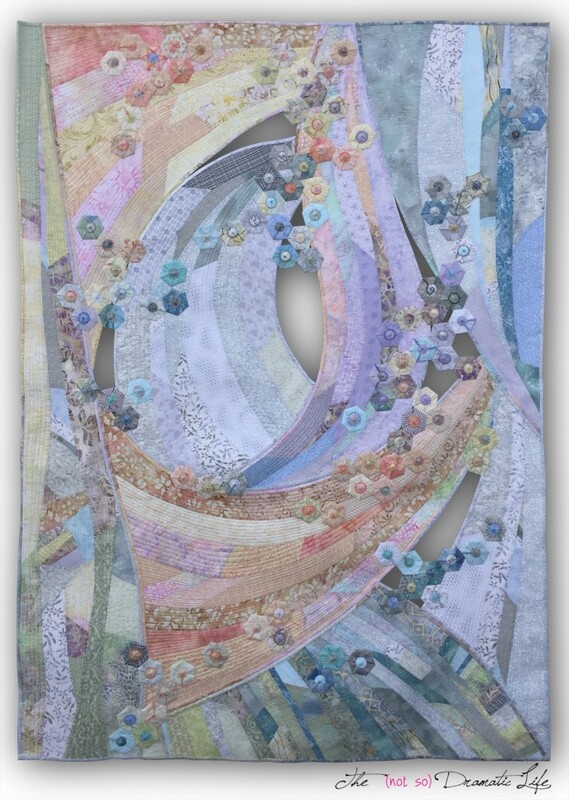 UPDATE: Craftsy removed this pattern (along with thousands of others) during their site-wide revamp. 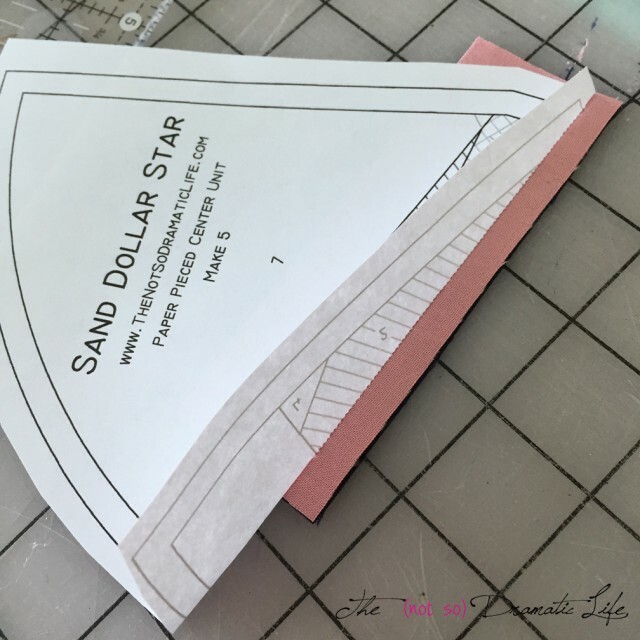 The Sand Dollar Star pattern is now available on Etsy. This post focuses on a photographic tutorial of constructing the block, while the PDF directions contain more than 20 diagrams and thorough instructions explaining the construction of the block. I like to start with the outer surround that is constructed from four pieces cut from the provided template. 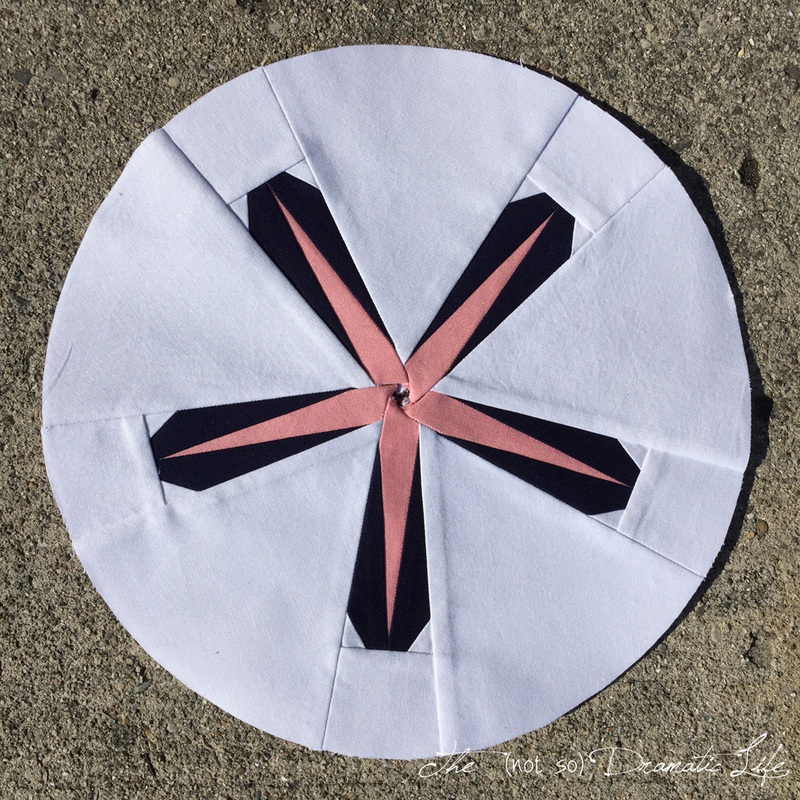 Four short seams create an open circle that you will set the center star into. I like to press the seam allowances open to reduce bulk for this part of the block. 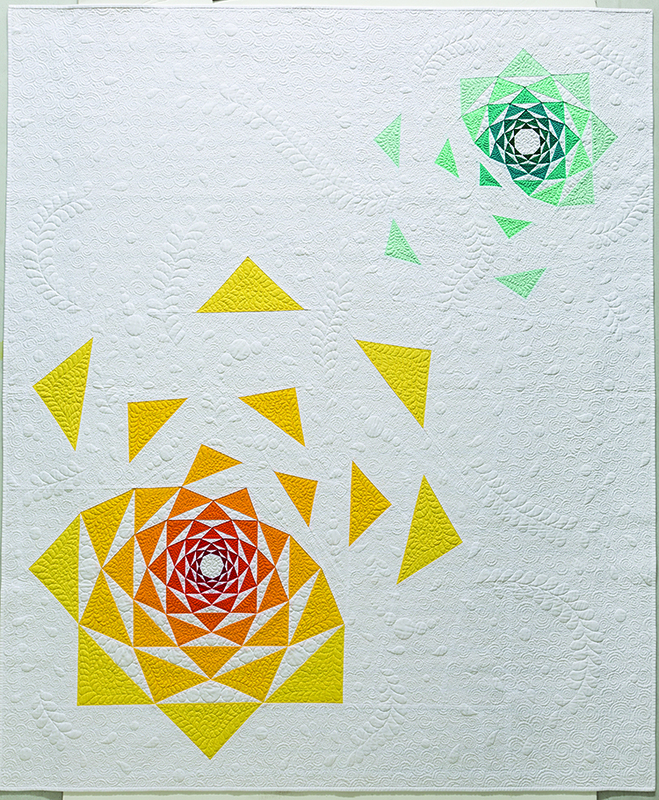 There are five foundation paper piecing (FPP) segments which come together to create the circular inner star. 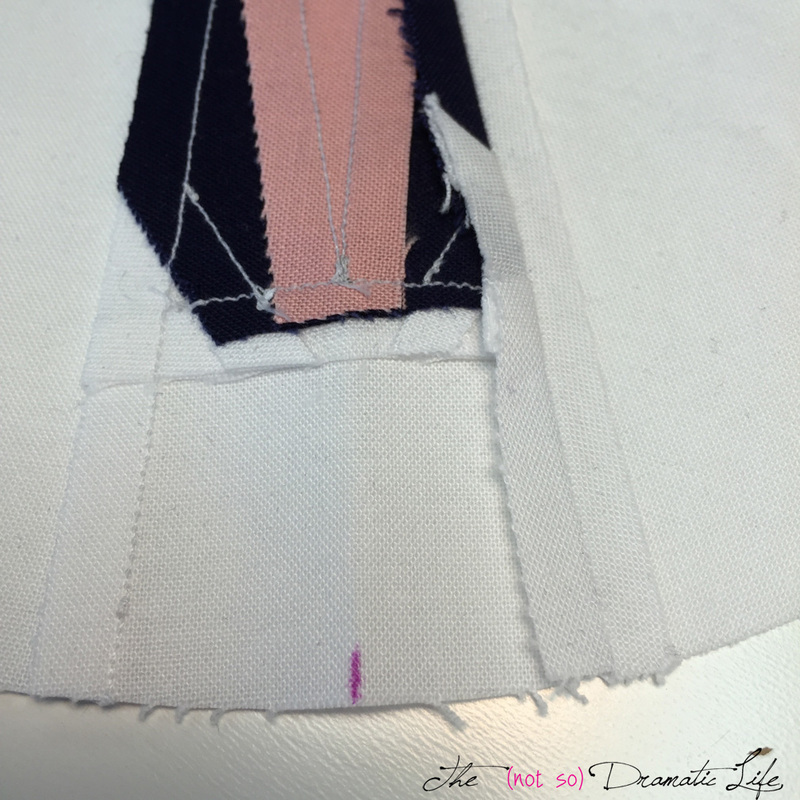 Each segment starts with placing pink fabric, right side up, over area 1 on the unprinted side of the FPP template. 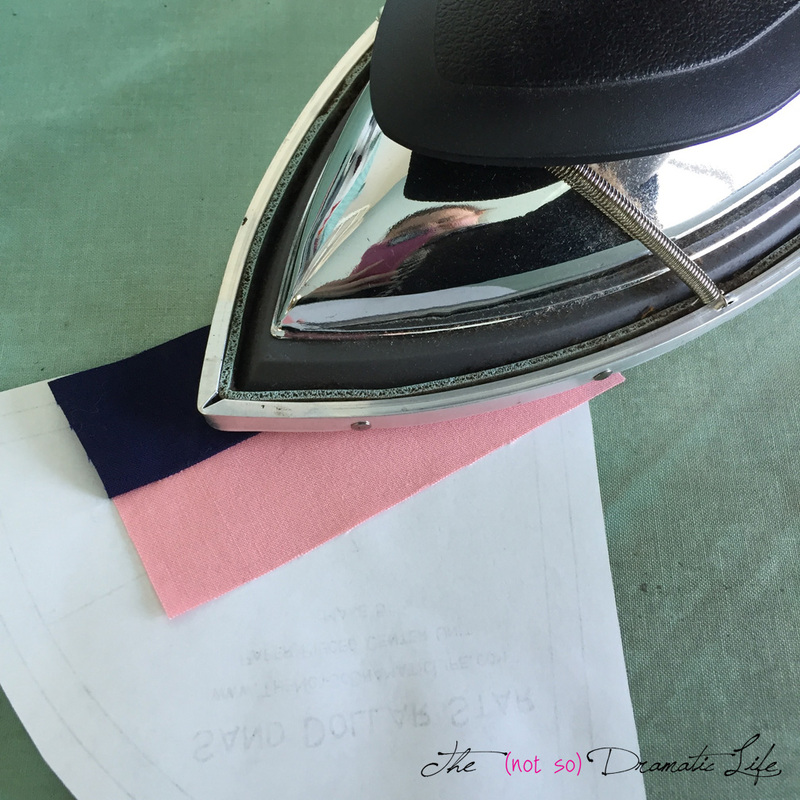 I like to hold my template and fabric up to a light source to check my fabric placement. Place the dark blue fabric for area two over the pink fabric with the main body of the fabric over area one and the “seam allowance” over area two. 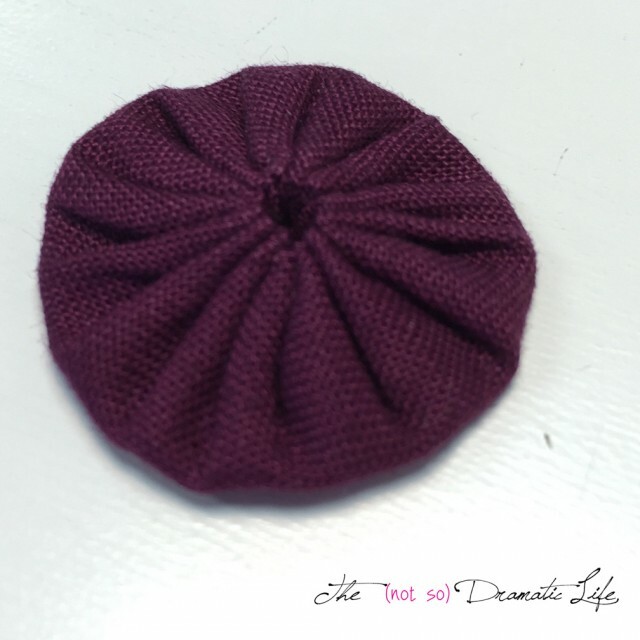 Flip the entire unit over and use a small machine stitch to sew along the line between areas one and two. 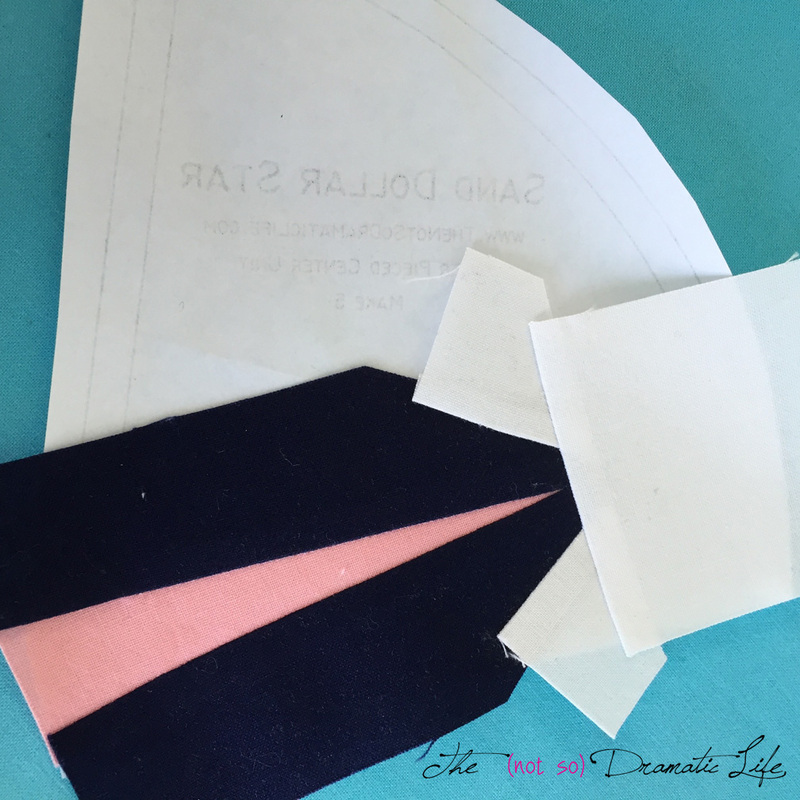 Fold the paper back to use a rotary cutter to trim away the excess fabric, leaving approximately 1/4″ seam allowance. 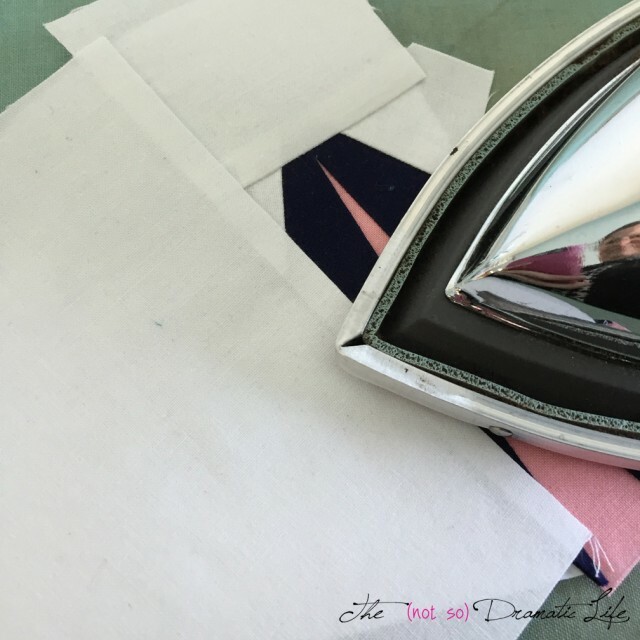 Press the fabric into place before moving on. Repeat the FPP process for areas 3 through 7. 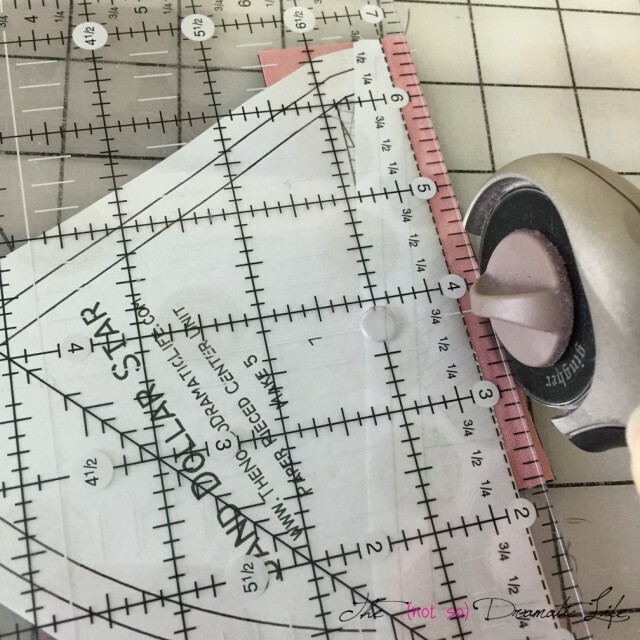 Once the entire segment is stitched into place, make sure it is well pressed before trimming the straight edges with a rotary cutter and ruler. For this small amount of cutting I don’t worry about using my good cutter on paper- what can I say- I like to live dangerously! 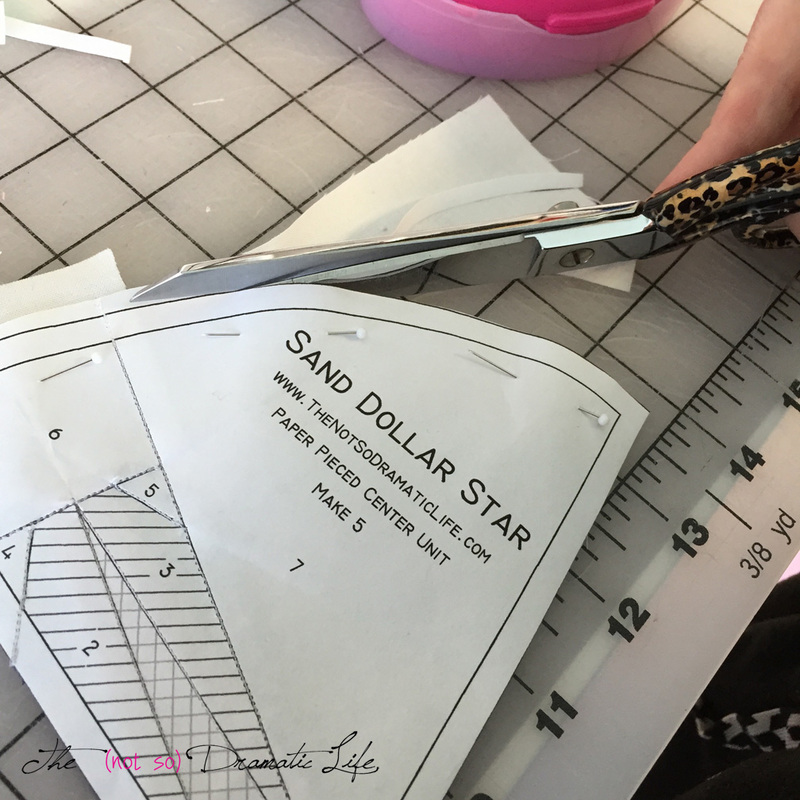 I prefer to cut the curved edges using good quality shears. 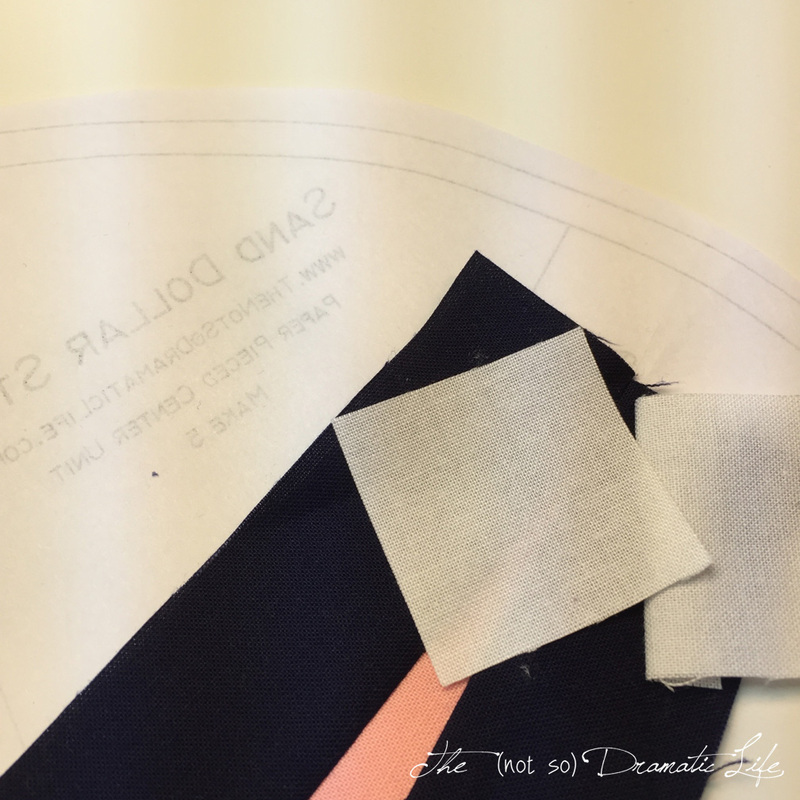 The fabric for section 7 is large and a bit floppy, so I think it is helpful to pin slightly in from the cut line, so things don’t shift in an unpleasant manner. Repeat this process four more times to construct all of the pieces for the center of the block. 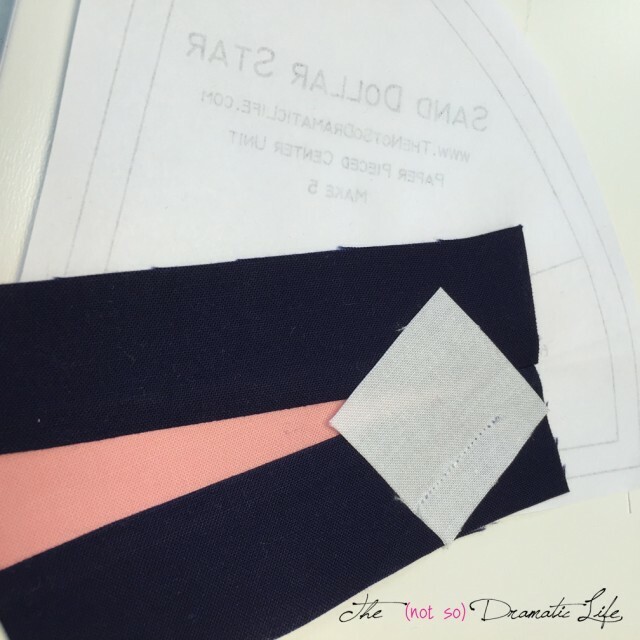 Stitch the segments together. I like to stick pins straight through at the points that I want to be sure will match up. 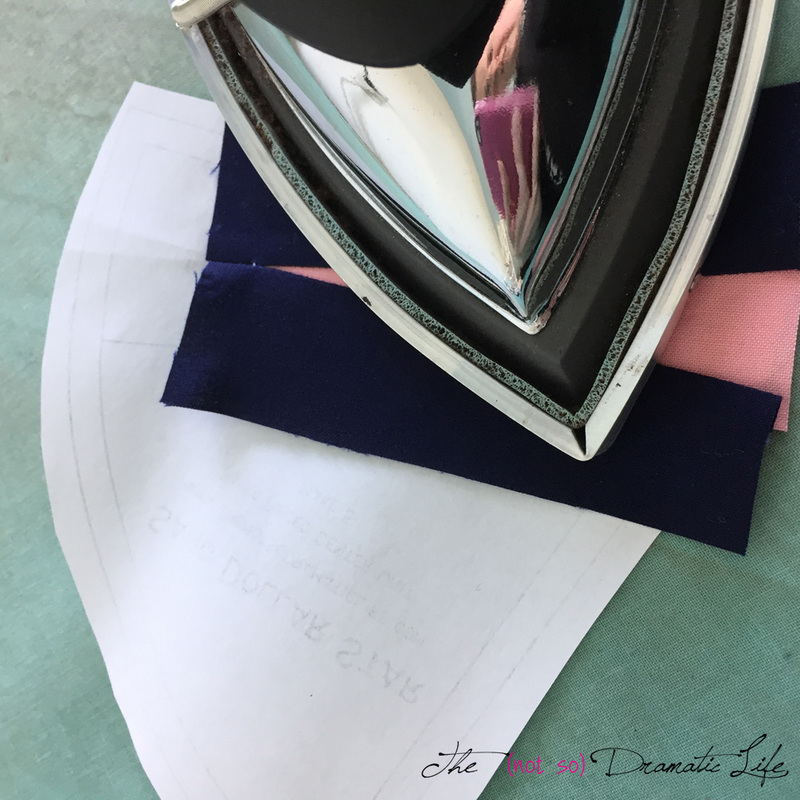 Then I use Wonder Clips to hold the rest of the seam in place. 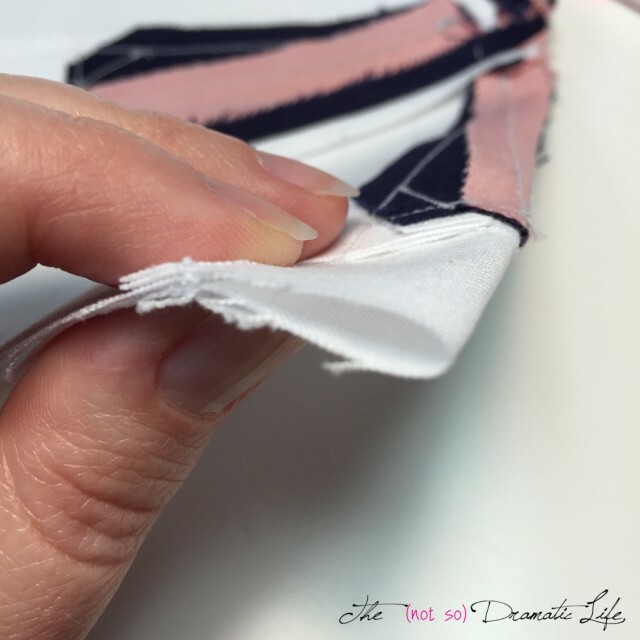 Sew all five sections together. One of the awesome things about this block is that there is an opening left in the center of the block (don’t worry, we’ll cover it later) which means there are no precise points to match! 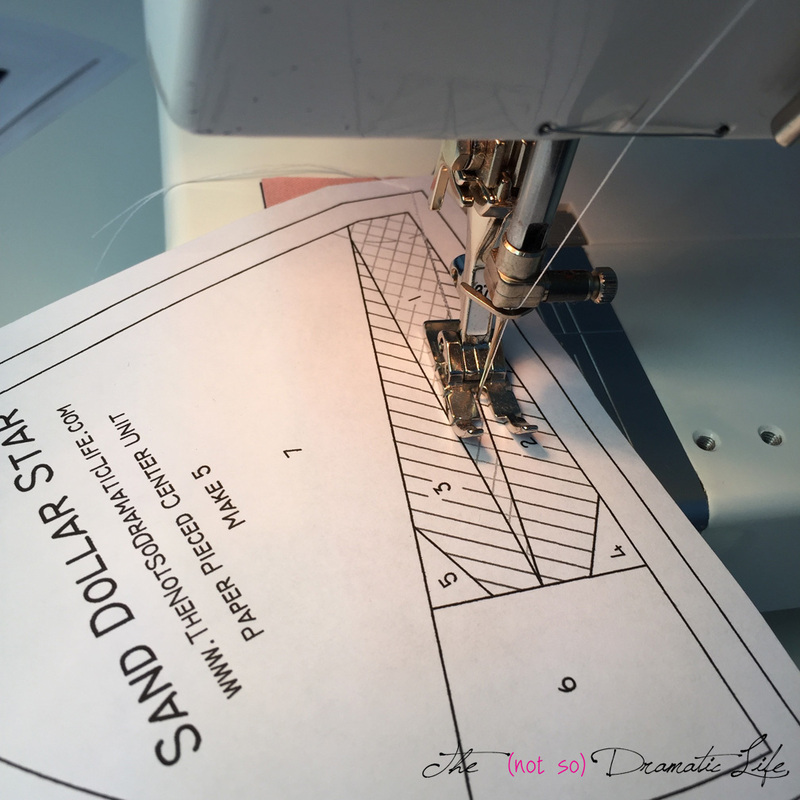 Press the seam allowances open and press the entire unit thoroughly. Now you need to remove the paper. 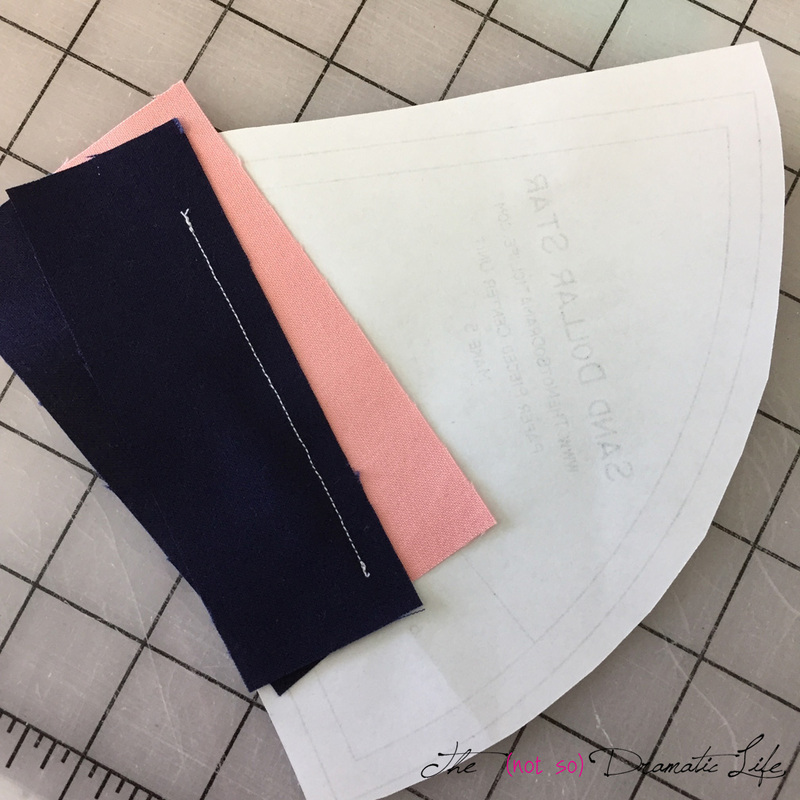 If you haven’t done a lot of curves or you are afraid the edge of the circle may stretch, do a machine straight stitch in the seam allowance (about 1/8″ from the edge) along the outer edge of the circle before removing the paper. 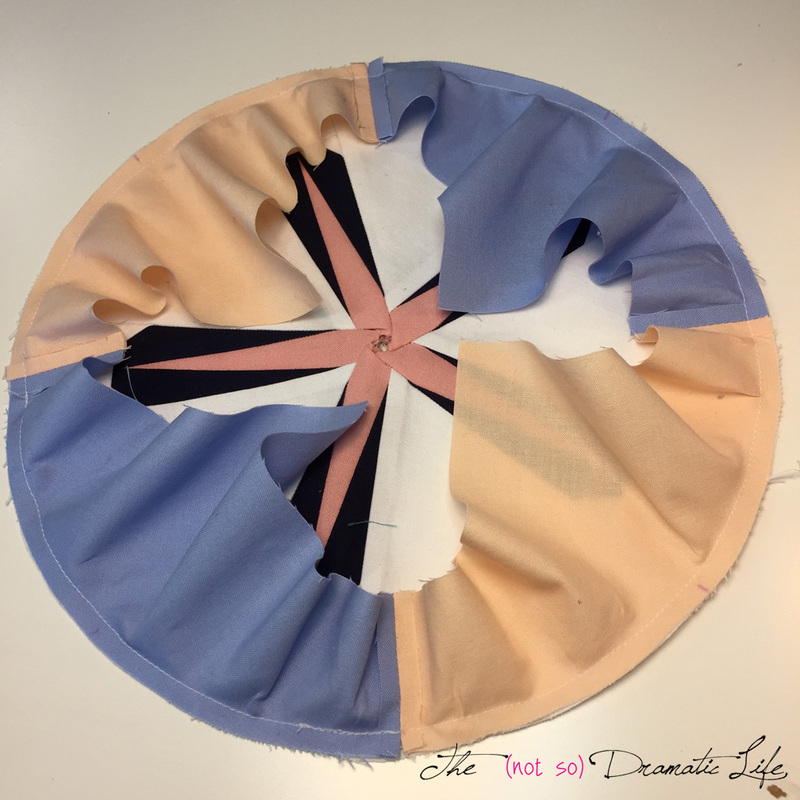 This stay stitch will help keep things from stretching and distorting before you have a chance to sew the center into the outer surround. 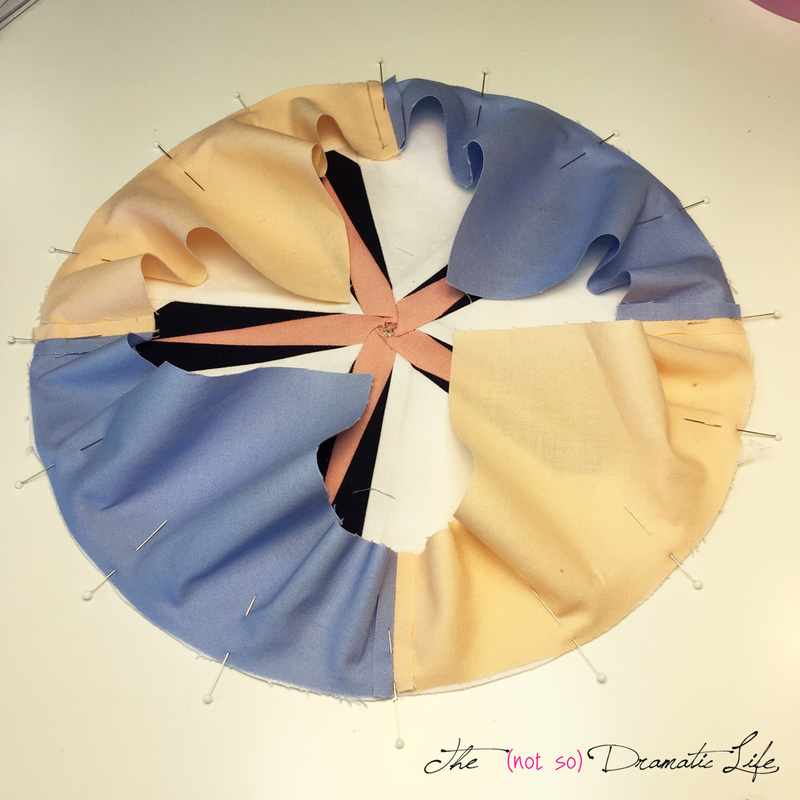 Its time to create some registration marks to help in sewing this circle. 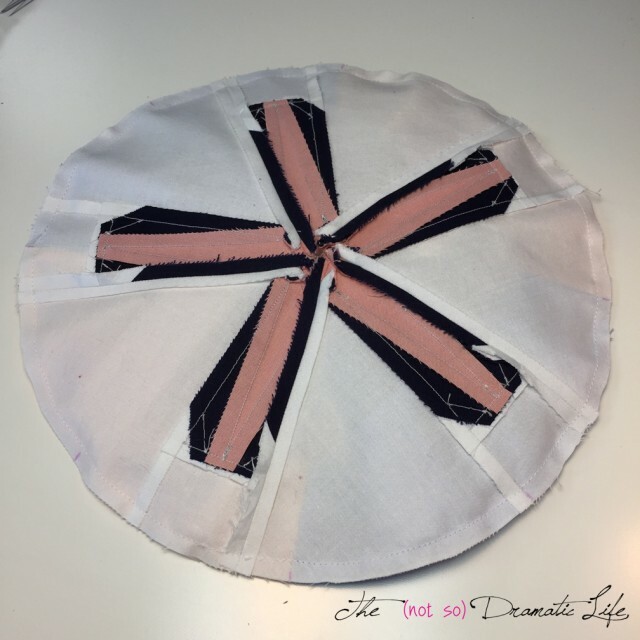 Fold the inner circle in half, making sure that one of the pink star points falls on the fold line. 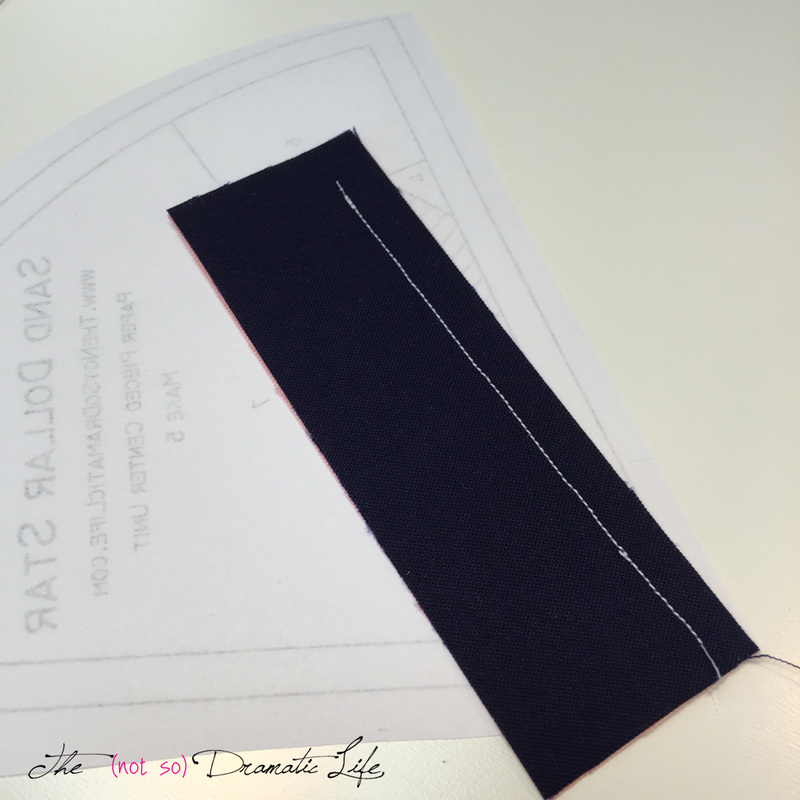 Use a disappearing marker to make a small tick mark in the seam allowance on either end of the fold. Only one tick mark will line up with a point on the star. I use this for the top of the block. Fold the block in half again, this time matching the first tick marks to each other. Fold to find the halfway points between all of the tick marks on the circle. You should have a total of eight marks. On the outer surround the seams act as the first four registration marks. Fold each segment in half to locate the halfway points. Match the registration marks around the circle and pin in place. 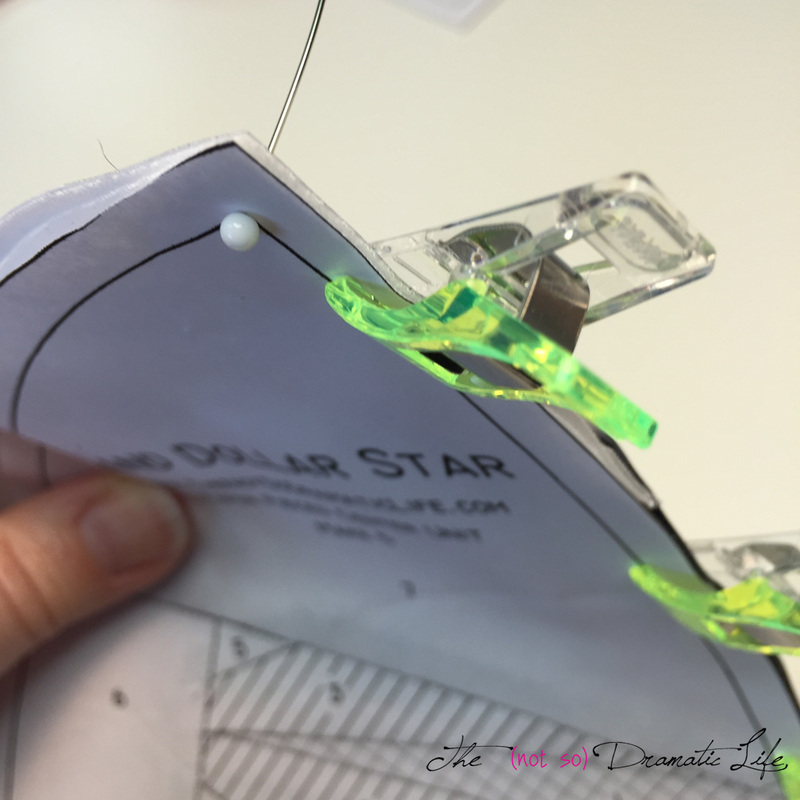 Add extra pins to hold everything in place while you sew. Use as many as you need to make the edges line up as you sew. 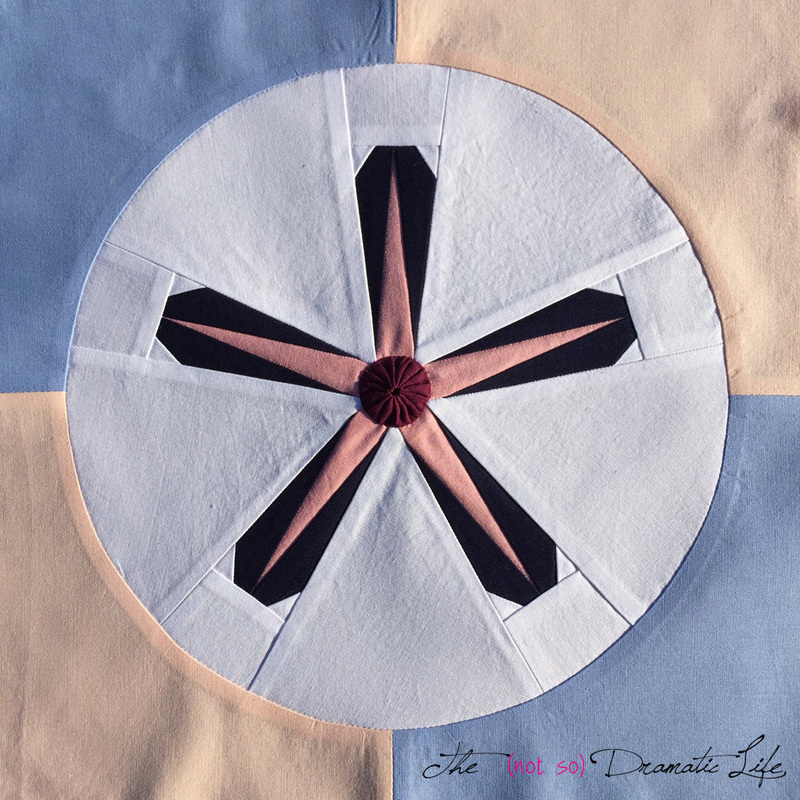 I like to stitch with the surround on top and the circular star on the bottom. Check both the front and back of the unit to make sure there aren’t any tucks or puckers in the seam. It may look a bit rumpled when you first flip out the surround . 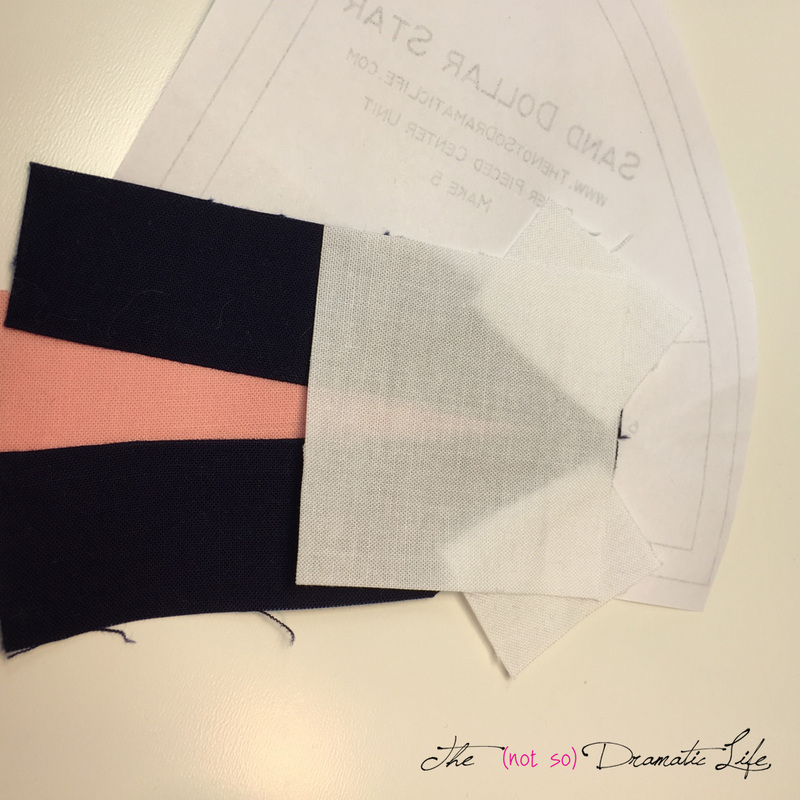 . .
but as long as there are no tucks in the seam, it will press out nice and flat. I generally press my seam allowance toward the outer surround. 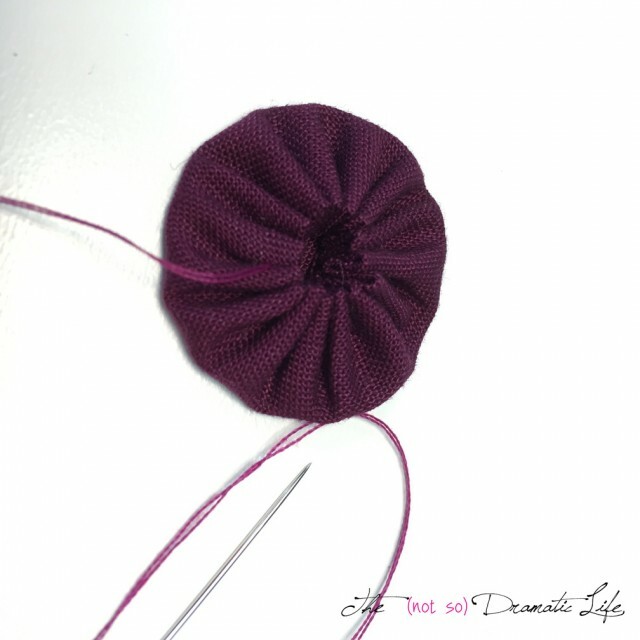 The only left to do in making this block is to close up the center of the circle. A fabric yo-yo does this while adding a bit of texture and dimension. You will use the provided template to cut the circle and a doubled thread to do the stitching. 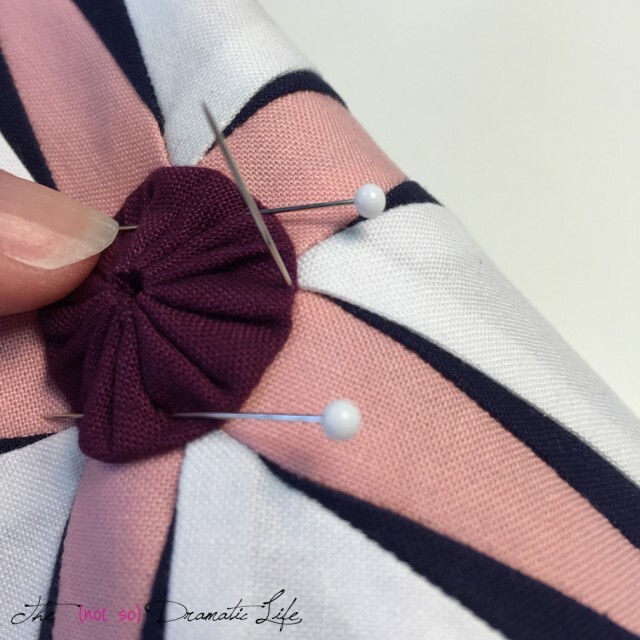 Make sure the knot falls on the wrong side of the fabric. 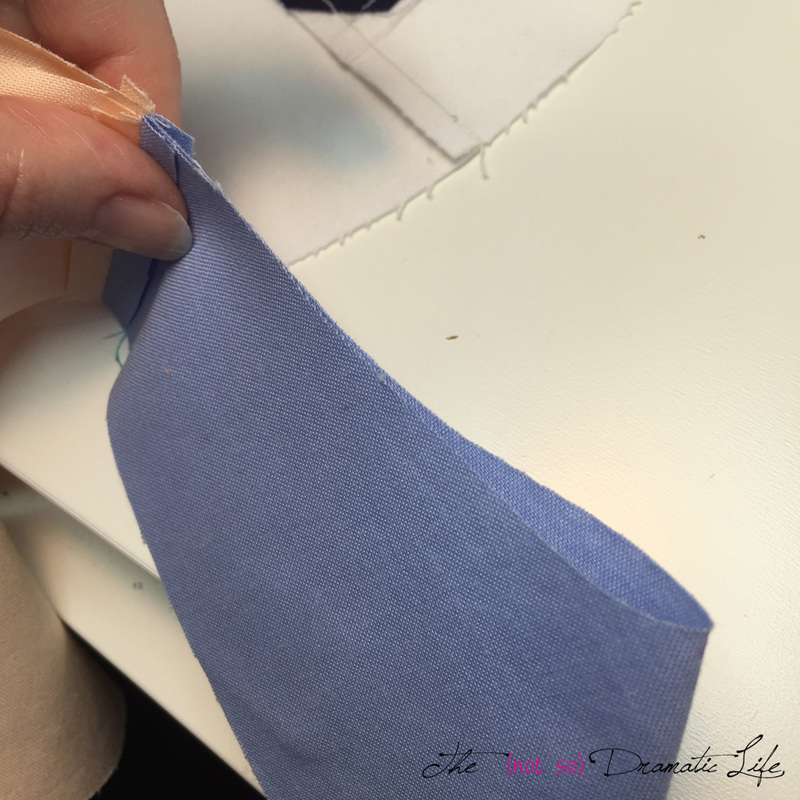 Do a hand running stitch around the edge of the circle turning the raw edge of the fabric back about 1/8″ as you sew. 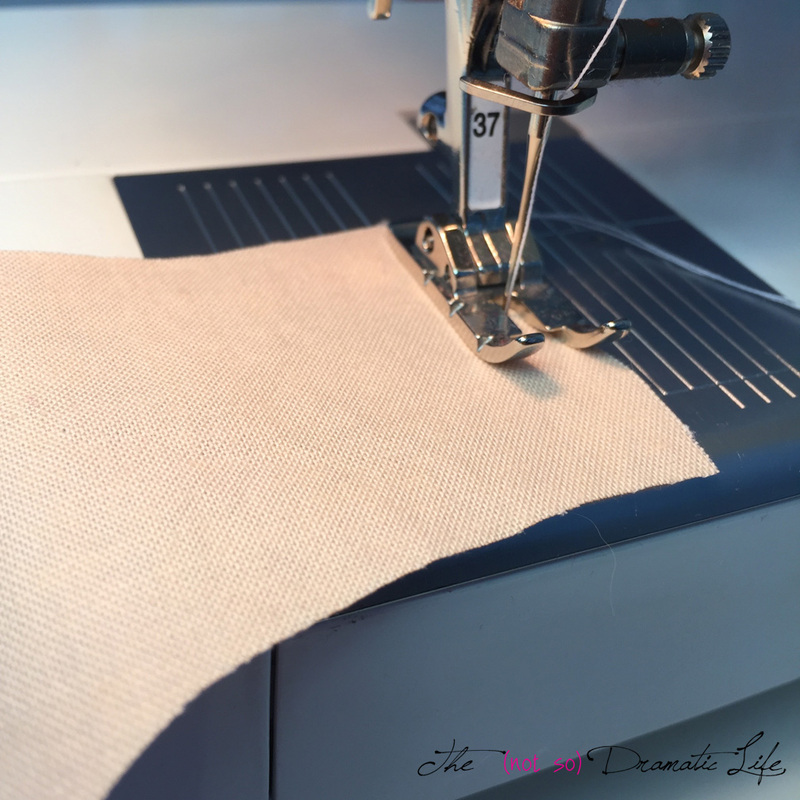 For best results, your stitches should each be about 1/8″ long. 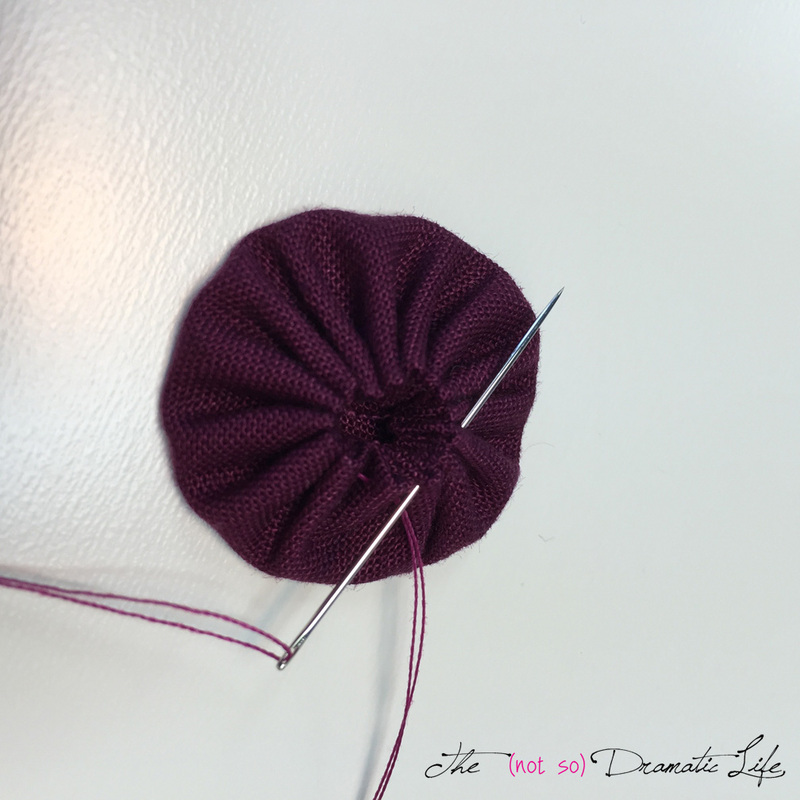 When you have gone all the way around the circle, draw the thread to gather the edges of the circle into the center point. 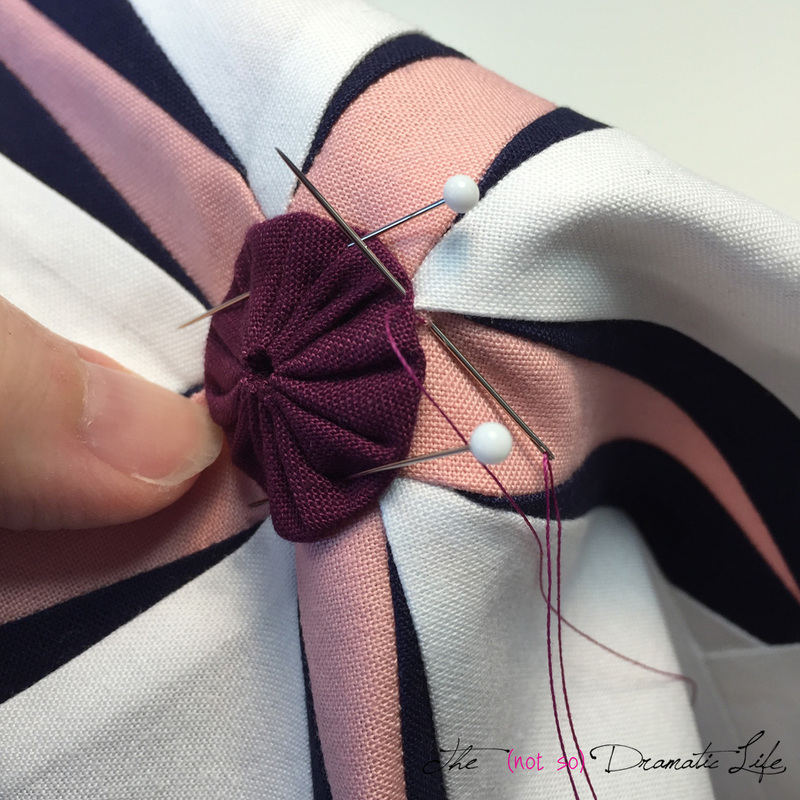 To further secure the yo-yo and help control any unwieldy gathers, I like to stitch through the pleats two or three at a time. Knot off and bury the thread before clipping. Position the finished yo-yo in the center of the block. 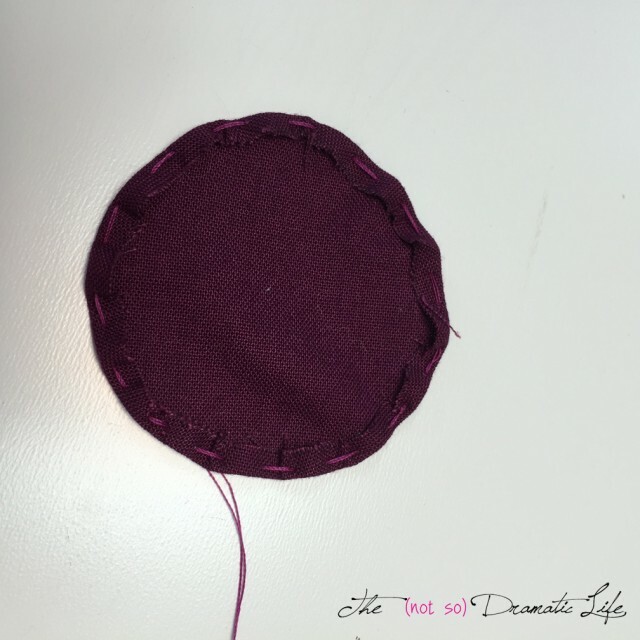 Take small appliqué stitches around the edge of the yo-yo to secure. 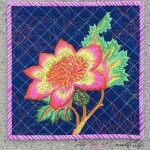 Many small stitches are preferable to fewer large stitches. 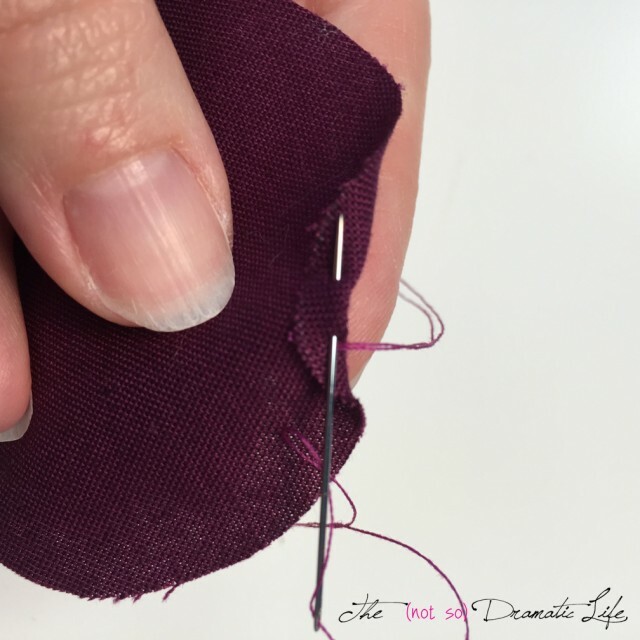 As you stitch, try to have as little thread show as possible. Visible thread tends to be the weakest part of hand sewing, so keep as much of it as possible behind the fabric of the main block or the yo-yo. Use this block as a primary block design for a quilt, combine with other blocks for a seaside sampler quilt or table runner, or add borders to a single block to create a mini quilt or pillow. 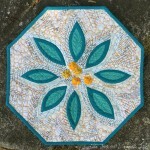 When you head over to Craftsy to download the pattern for this block, I hope you will take a look at my other patterns as well!